Unlike others, I thought this was a very great treatment of an important Founding Father. Henry does not receive the attention that he deserves. Part of this rests in the fact the he fought signing the Constitution. I mean the winners write history, and we know who one. It was not Henry, or even Mason. Before the debate over the Constitution, Henry was a figure who was self-made and very principled. What you will not get in this particular work is a great deal of rumination upon Henry's motives for his actions. You get a solid recounting of his actions and their consequences, but not why they occurred. Regardless, this is a work that represents the most useful treatment of a forgotten Founder. Most Americans are aware of Patrick Henry's famous, "Give me liberty, or give me death!" speech, but that is where most of our collective knowledge ends. In "A Son of Thunder" Henry Mayer helps to acquaint us with one most polarizing men of the revolution. What is surprising is that Henry only participated in two sessions of Congress - 1774 and 1775 - and was not a signer of The Declaration of Independence. Mayer is very effective at showing how Patrick Henry was able to use his position in the confederacy's most populous (and important) state as a force for change. Henry may have been the first ever "Populist" in the world of politics. He specialized in taking and forming the opinions of the lower class farmer into political debate.It really is amazing that Henry's name lives on despite his virtual absence as a player in the newly formed Federal government. -	Henry was the first governor of Virginia and was followed by Thomas Jefferson. -	Henry was a strong opponent AGAINST the Constitution - and felt that Americans needed a very strong Bill of Rights to protect both the people and the states. -	Henry was one of the very first men to call for a war of Independence with Britain. Final Verdict - Despite the lack of personal reflection "A Son of Thunder" is still a worthy biography of an important contributor in the American Revolution. While it is not as colorful (or interesting) as McCullough's "Adams" or Chernow's "Hamilton" it is well-worth reading for anyone who enjoys Revolutionary history. Patrick Henry is one of the forgotten founding fathers despite heralding one of the most famous lines of the revolution "Give me Liberty or give me Death".His role in military affairs, government as an anti-federalist, and as governor of Virginia was pivotal acts in the revolution.Henry served with George Mason as the primary anti-federalist and arguing against the addition of a large government with enumerated powers and felt the only way to defend liberty was through a bill of rights.This bill would guarantee the peoples freedoms against an encroaching government.Patrick Henry was the master of back door politics despite his distaste for it and even carried on an illegal war in the Virginia back county almost leading to a siege of Detroit.The state of Virginia at the time of the Civil War was largely through his efforts and his expedition that took significant territory from what might have been PA or MD. 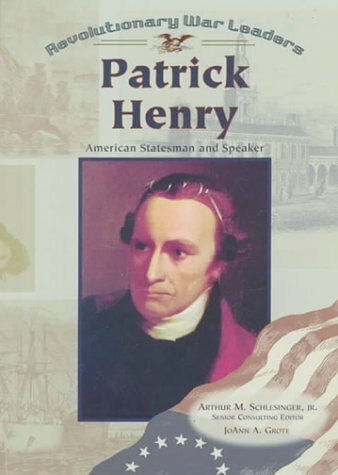 One of the most interesting parts of this book is the idea that Patrick Henry represented the common man and was truly the peoples voice during the debates in Virginia and Philadelphia always arguing for the rights.The author does a very good job of making this case and I find it very hard to refute.Henry's speaking ability was undisputed as a man of the people and a person who could get crowds energized and excited. He seemed to thrive off that attention using his background as a man of the people (not of the landed gentry) to draw his audience in. For those looking for a different take not often discussed in the literature and really seeing something from the anti-federalist point of view I highly recommend this book. 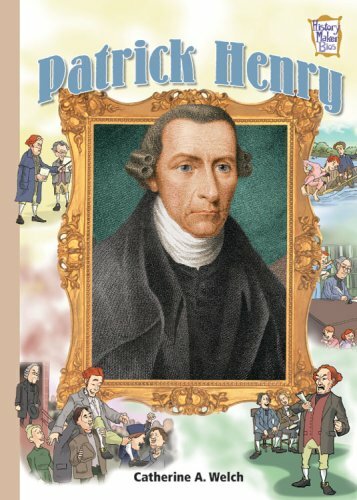 The most complete biography of Patrick Henry and much more. 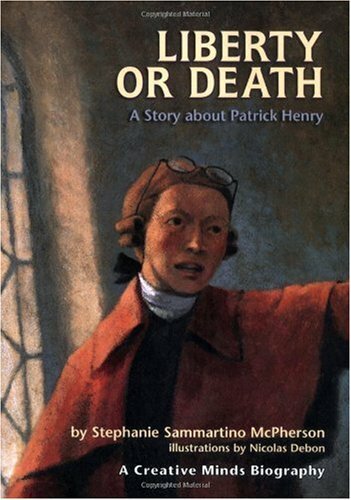 Patrick Henry one of the greatest founding fathers and the match of the American Revolution! For such a popularizing figure...there's not a lot of books on the subject. 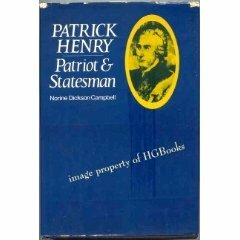 This book lacks a little information on Patrick Henry's childhood but it captures his career as a lawyer and politician. This book is also very complete in Virgina history. I picked up several new areas of history and it even details Washington, Jefferson, Madison, etc. Hi recommend this book to all lovers of History! First, let me apoligize for not having a bibliography of better works on this truly amazing man.I love this country and the giants who founded our country did so on ideals of freedom and liberty, often at great cost to themselves.While the status quo would have served them well, many of them sacrificed of themselves for higher ideas.It makes one reflect where we are as a nation when we do not teach these ideals and where it got our country. I was born in Canada and moved to the USA in the fifth grade. I am proud to be an American, though proud of my Canadian heritage, consider myself an American first and foremost. I dug into this book and found items about Mr. Henry's life which I did not know and made me appreciate him more.But I have to say, that the author went overboard to the extent of almost ridiculous in touting Mr. Henry's virtues.His life did not need this author to hold him up as his courage and integrity did so.What I mean by overboard is almost anything that did not go perfectly with Mr. Henry, such as leadership in the military, was because of shortcomings of everyone else, including George Washington.The unnecessary spin on virtually everything Mr. Henry did almost stops one from reading the book obviously aimed at approximately the 7th grade or younger. One would think everyone else was a complete dolt except Mr. Henry. It was repetitive enough that it was somewhat drudgery reading it to completion which I did.A book published about Mr. Henry's accomplishments, courage, and leadership which helped shape this fine country would be better than an apologetic. Any information on any books relating to our founders, Thomas Jefferson, Sam Adams, Patrick Henry, Paul Revere, Ben Franklin, and many others would be much appreciated.I am not interested in a liberal rag putting down our founding fathers.Have you ever seen a person with Thomas Jefferson's great mind and accomplishments have literature focused on whether he fathered children out of wedlock, and if he did, this makes his words worthless?Just thing of many poets, heads of state, actors, athletes, and many other examples who have led sleazy lives and done many a repellent act but yet not a word about those character traits.Knowing the whole person is interesting from a factual standpoint, but not to twist an agenda against the founders of this great nation. I am also not interested in books that push the envelope the other way.History is best when the author's approach is to look at a person in the context of their time and faithfully reproduce as much about their lives as they can.We the readers can decide what to think. I would say this book is for a younger audience but not the best for them either as I feel it was an effort to distort positives when unnnecessary. 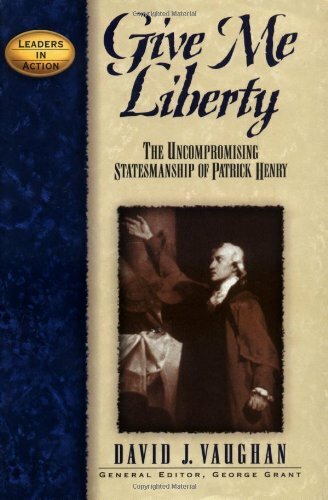 Give Me Liberty is good because its subject--Patrick Henry--is so interesting, influential, and great. The book is divided into three sections: Henry's life; his character; and (briefly) his legacy. His life was amazing (perhaps more important to the Revolution than anyone save George Washington), his character was almost impeccable, and his legacy is enduring. Author David Vaughan writes on the backs of others: his sources are secondary. Vaughan also writes from a Calvinist perspective. That causes him to treat Henry's Christianity seriously, but also causes him to overstate Calvinism's importance. For instance, Vaughan all but says that Calvinists brought religious liberty to the colonies; he ignores the Baptists' profound influence in securing religious liberty and the history of Puritan persecution of Baptists in New England. There are a few other problems with the book: Vaughan treats Henry as almost flawless. And--perhaps due to the format (separate sections concerning Henry's life, character, and legacy)--there are many repetitions, which should not happen in an under 300 page (with small page size) biography. Despite these problems, Give Me Liberty contains a concise, interesting, and readable study of Henry and the leadership qualities he exhibited. 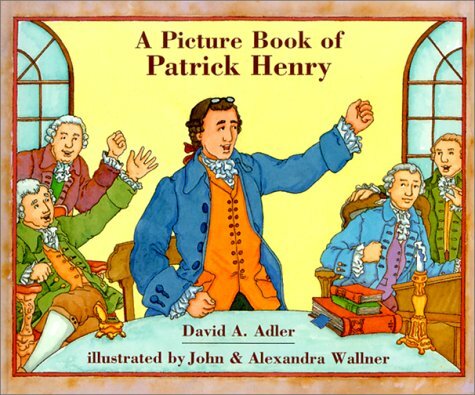 How few books there are about Patrick Henry. The only thing people seem to know is the phrase, "give me liberty or give me death". This book gives an easy to read overview of his life and (like others in the series), highlights different character traits. Overall I really enjoyed this book, and it held some new information on Patrick Henry of which I, a professed afficionado of the man, was not aware.It is written in simple, understandable language, but it ended up becoming a little redundant as it progressed, repeating some things from chapter to chapter as if the author thought that a person would be jumping around to read only segments of interest, rather than reading through from start to finish.But I would still recommend it to anyone who asked. Thank you, Mr. Vaughan, for pointing out what many if not all public schools leave out of history... the fact that it was founded on Biblical principles by Christian men. I'm not saying that all the founding fathers were Bible believing or lived a moral live but that fact that Patrick Henry was such a HUGE part of it and he WAS a Christian and moral person was impactful to our nations birth. This book is well-made and an obvious mini-labor of love, and serves several valuable purposes: cataloging Henry's book collection assiduously, introducing the reader to this rather unknown figure, and summarizing the contents of many books the standard American gentleman of the time might have in his library. The book does have its limits, subsisting on a lot of circumstantial evidence about Henry reading such and such book and being influenced by it in his actions. These are not unreasonable speculations, and the author is not given to many flights of fancy, and the book is short, so it makes for fairly satisfying reading. The book is reasonably entertaining, with amusing quotes from Henry and his contemporaries on anything from French cooking to weightier (if less creamy) matters. And it is well-written, with very few phrases that made me cringe upon reading: a medicine book "well-worn from frequent bethumbings" and "David Henry knew more about Grub Street than grubworms" being a couple. The author alludes to Henry's reputation as a man without system, of his somewhat unlearned pronunciation, and other sparsely documented traits, in effect telling the reader that there is probably much we'll never know about Henry, who as an old man apparently composed splendid sonnets for his family, only to burn them after his children played and sang them. Thanks to this book, I am awash in memories of my time living in Williamsburg VA, and am even more eager to read the bios by Beeman and Mayer. Any bibliophile or lover of colonial American history will probably find this brief book worth adding to their personal library.
" '...every other man's library is an object of curiosity....' "
The Mind of a Patriot: Patrick Henry and the World of Ideas, on page 91, quotes Walter Besant further about the habits (or at least inclinations) of bibliophiles: " 'The lover of books may be distinguished by one trick he has which betrayeth him. If he is in a strange house he makes straight for the shelves: before anything else he hastens to take stock of the library.' " Judge Spencer Roane, who evidently was an avid book lover, got his chance to do just that when he lodged with Patrick Henry and his family. The judge "observed: 'As for the general character of Mr. Henry's library, I readily believe that he had not a complete of regular one....I...saw his library fully. I remarked that it consisted sometimes of odd volumes...but good books.' "
Kevin J. Hayes, a professor of English, explores that library. Or more correctly, he explores the books catalogued as a part of Patrick Henry's estate inventory. Henry's library wasn't extensive, but the fiery patriot known for his "give me liberty or give me death" speech, probably owned more at various times during his life, so the 188 books listed in the appendix also include some volumes that weren't present after Henry's death in 1799 but for which "sufficient evidence survives to justify their inclusion." Among the listed titles were various Latin and Greek primers and classics, manuals and texts for the study and practice of the law, various political theory and history books including ones discussing forms of government and the moral and economic problems of slavery, English and rhetoric books including dictionaries, a few novels, and some travel books. Works by Homer, Pope, Shakespeare, Swift, Demosthenes, and DeFoe are represented. Hayes provides solid suppositions for how these books helped form and support Henry's continuing studies and his views on freedom and rights, among other things. Hayes use of Henry's library to defend him on a number of issues meets with varying degrees of success. But on the matter of slavery, no attempt at mitigation is expected or made. Apparently for economic reasons, Henry never freed his own slaves, despite recognizing the inhumanity of the "institution," and that fact is simply acknowledged. Hayes' first of seven chapters deals with how Henry's contemporaries perceived him. In particular, how Thomas Jefferson did. Jefferson, whom Henry opposed concerning the adoption of the federal constitution, "generally praised Henry's oratory yet critiqued his learning." Others also portrayed Henry as a man who relied more on intuition than logic and scholarship. Early Henry biography William Wirt was one, relying considerably on Jefferson's opinion. In part these assessments were based on Henry's relatively small library. Jefferson who famously said, "I cannot live without books," amassed thousands in his own library and apparently thought Henry's collection the mark of a man who wasn't very educated. But Hayes points out, "To men like Thomas Jefferson or Benjamin Franklin or John Adams, a library was an auxiliary storehouse for the mind....Henry, on the other hand, sought to internalize what he read....By keeping his library small and reading perceptively and intensively, Henry was able to make his books a part of his mind." 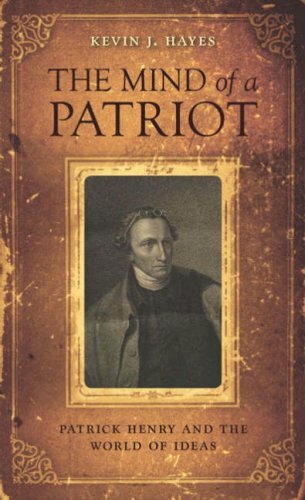 With just 106 pages devoted to the main text and 184 pages in total, The Mind of a Patriot is time friendly -- in contrast to many of the weighty tomes published about the fathers of the American revolution. This isn't a definitive biography; it doesn't pretend to be. It is, rather, an valuable ancillary resource. It is also a bibliophile's vicarious way of joining Judge Roane in perusing Patrick Henry's shelves. Recommended. 4.5 stars. Here, Kevin J. Hayes focuses on the books that formed the small library of Patrick Henry. 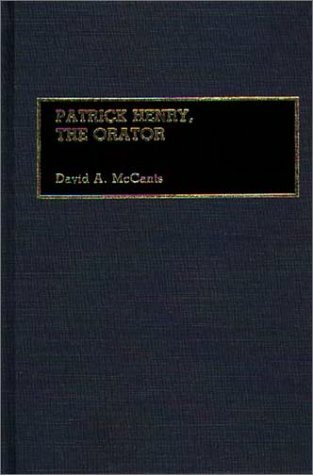 This short but useful effort does not attempt to be a biography of the great orator of the Revolution, but its reading will help one understand the type of person Patrick Henry was and the intellectual influences that shaped him as a young attorney and beyond. Those who enjoy this book would certainly also enjoy another of Professor Hayes' books: "The Road to Monticello: The Life and Mind of Thomas Jefferson." Just a note to begin: The copy I read was library-bound, not leather. Never heard of leather-binding for this series. This slim volume serves as a nice introduction (or refresher) to the subject for middle-schoolers on up. 3. The Parsons' Cause: "Enemies of the Community"
4. "If This Be Treason"
8. "Gale from the North"
The book has good info on Henry's family, education, and early career(s). But, not surprisingly, it concentrates on his participation in the early colonial protests in the mid-1760s thru early-1770s, his involvement in the early conventions and Congresses, and through the American Revolution. 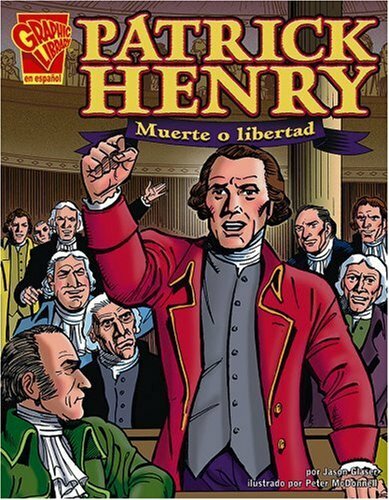 It also discusses Henry's multi-term governorship of Virginia, his concerns with the new U.S. Constitution and efforts to get a Bill of Rights passed, and finally his death in 1799. Various parts of his personal life (e.g., marriage, kids, sickness, business problems) are interwoven throughout, though some areas are a little scarce. There are one or two sections where it seemed that the primary subject (i.e., Henry himself) got somewhat lost in the discussion of the revolutionary events, but it's certainly possible that it was the authors'/publisher's intent, in order to further contextualize Henry's activities within the larger framework of the Revolution. The authors' writing style flows nicely (though with minor annoyances like those mentioned above) and is well-suited to its primary audience. I caught a couple of minor typos, but nothing that interrupted the flow or would cause a confusion of facts. As is typical for shorter and youth-oriented books, there are no end/footnotes. There is a 'Timeline' of Henry's life at the end, as well as a helpful Glossary, a short list of 'Additional Resources', a Bibliography, and a brief index. There are several photos and reproductions of paintings, documents, etc. (many color, others B&W), which I really appreciated. There were a couple here & there that seemed overkill and could have been replaced with more text, which is why I knocked off a fraction of a point for both Content and Style & Structure; but, they still serve to familiarize young readers with people & places in history, which is always a good thing. Overall, well done. I fully intend to check out other volumes in the series. 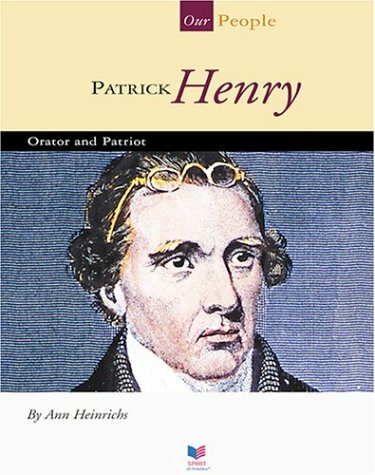 I had not realized how much we owe Patrick Henry for the Bill of Rights.There is just enough in this book to encourage me to read further on the myth and reality of Patrick Henry, the fallout with George Washington, and just exactly what was the problem between James Madison and Patrick Henry. 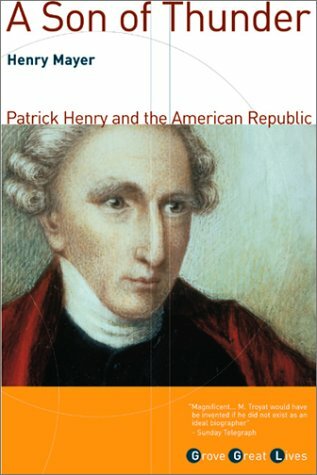 This is all briefly discussed in the book.Of course, the book was about Patrick Henry and could not possibly contain all this information.If you want to know just how important Patrick Henry was, and is, read this book.It will start you on a search separating myth from reality.